In contrast to Spring when all blooms fresh and green and bursting with color, during Fall we get to see that beauty anew as it comes full circle. Holidays help us bring the outdoors inside when the weather and the light changes. Fall is the time of harvest, of reaping the reward of the entire year’s labor. The hope is that the coffers overflowed and so would sustain us throughout the long months until spring. It’s a time that symbolizes abundance and gratitude — a fitting reason for a celebratory feast, shared with family, friends and neighbors. Thanksgiving is an easy DIY holiday, as so much can be made from things you collect from your yard, a local farm or a walk in the woods: Acorns, pine cones, corn stalks, brilliant orange, red and yellow leaves, vines with berries, dried grasses, pears and apples. 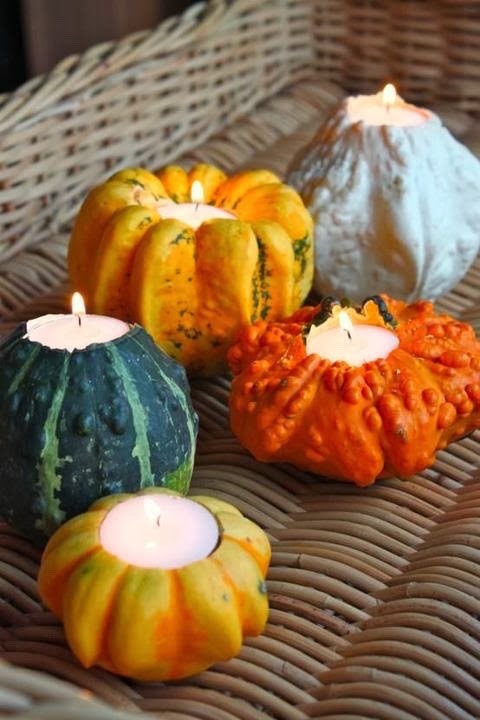 Re-purpose the gourds and any uncarved pumpkins leftover from Halloween and any baskets, jars, pieces of wood, even an old cutting board, twine, ribbons. 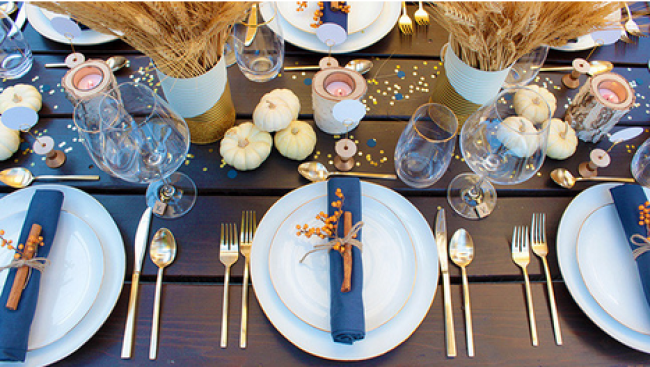 Tables are a focal point, so start with a theme or color, which you can adapt or enhance through the month with decorative cloths, colored glassware, patterned plates — or jazz up the simple, adding color and texture with inventive wrappings. The possibilities are simply endless. 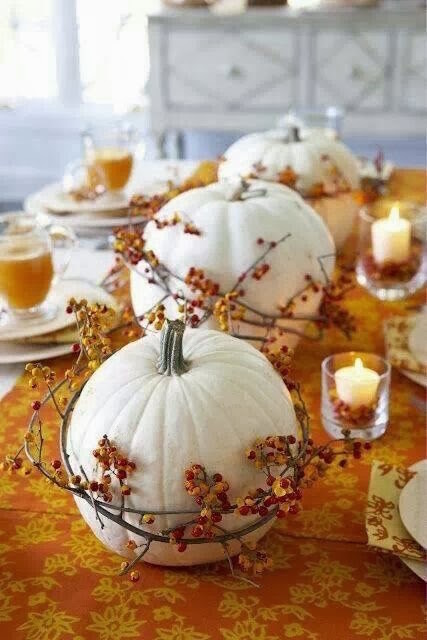 You can do beautiful centerpieces like the below, with naturally white pumpkins or a little white paint. Wrapping real branches and berries might be a trick, so visit Hobby Lobby or a florist shop it for their realistic options. Make your own whimsical placemats like the below – or use the technique explainer on CravingSomeCreativity.com for something else you dream up! 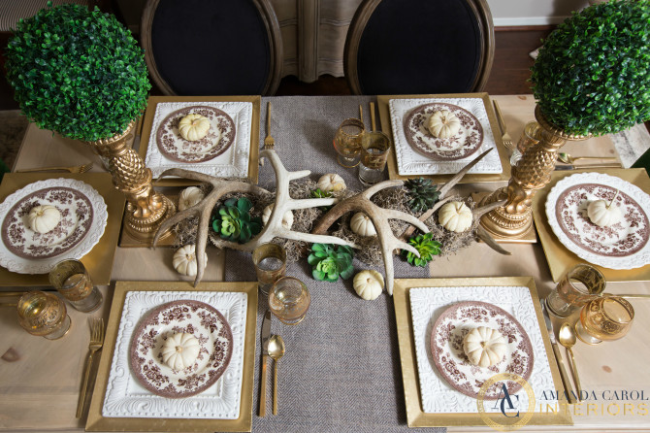 Check out Mountain Modern Life’s great post on 50 different nature inspired table scapes. Since daylight doesn’t last as long in these months, candles play a bigger part. Scoop out gourds (or apples!) to become votives with great results. Simply slice off the tops or scoop a hole about the circumference of your candle base. Use a sturdy teaspoon to scrape out the center just deep enough for it to fit, deposit the candle and voila! Depending on their weight and stability, you could use tapers as well. 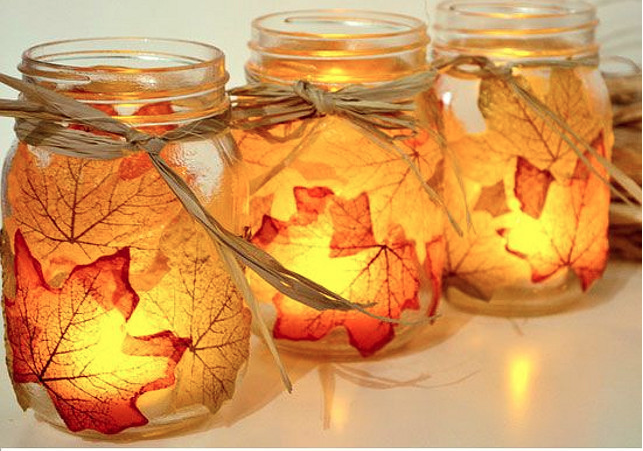 Make these warm and lovely lights with Ball Jars, leaves, a little Decoupage and twine. Follow the directions found on ViralSlacker.com. And if you want to be overwhelmed by ideas, visit Pinterest for a zillion! Make use of other natural display areas – your mantle, staircase, shelves and ledges, bathroom counters. 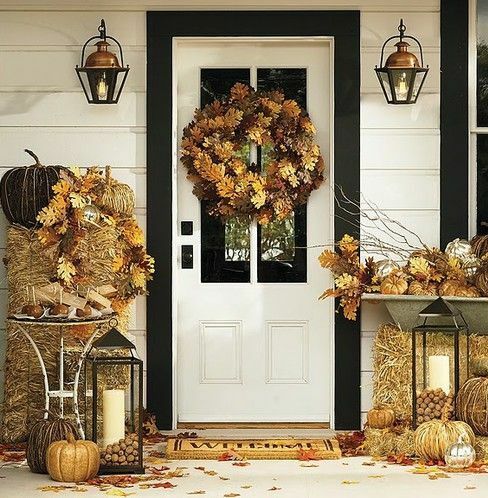 Little touches can be enough to create seasonal cheer throughout your home. 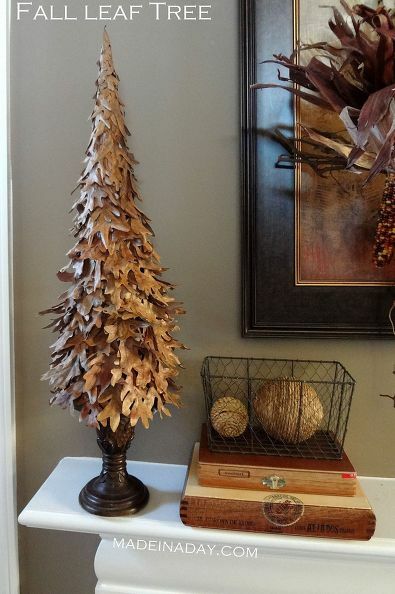 How about this striking leaf tree on your guest bathroom counter, or on your desk? Find the how-to on Made in a Day.com? There’s beauty in simplicity too, if that’s your style. Great if you don’t have a lot of time. This is so pretty on a stark white mantle – and yet if you added candle sticks, greens, and other décor, it would look great too. 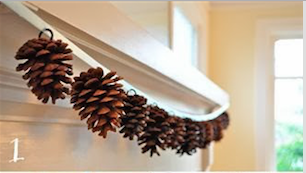 Attach hooks into the base of pinecones and affix to a wide cloth ribbon, then drape it across your mantle – or the top of any main doorways. Find this and more on FitMommieDiaries. 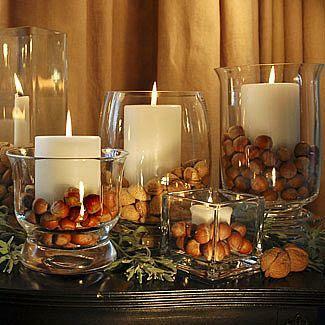 Fill hurricane glasses with nuts, place on a mantle or shelf at varying angles and heights and adorn with greens – or silver or gold. Get details Abby and Judd Langham’s blog. Banners are the big thing right now. They transform a wall, are simple to make, set the tone for any event and give a lot of bang for at best a few bucks. 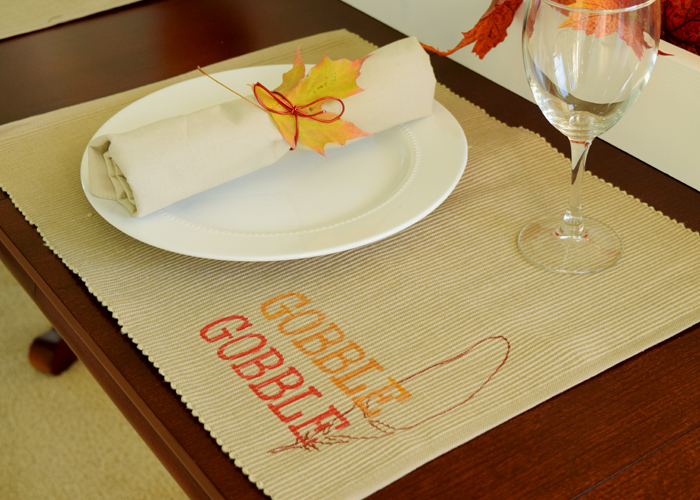 The Tom Kat Studio is offering this and other Thanksgiving themed printables for FREE and shows several great ways to use them within this color family. Check it out – very handsome stuff! On a budget? 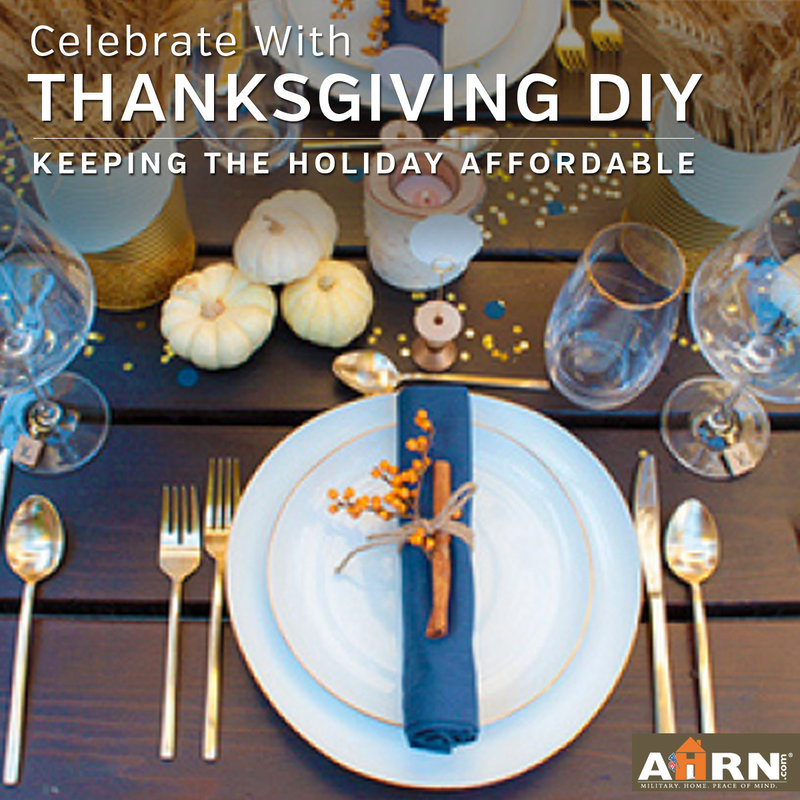 Check out the Huffington Post’s article on over 40 ways you can add little DIY touches your home this Thanksgiving. 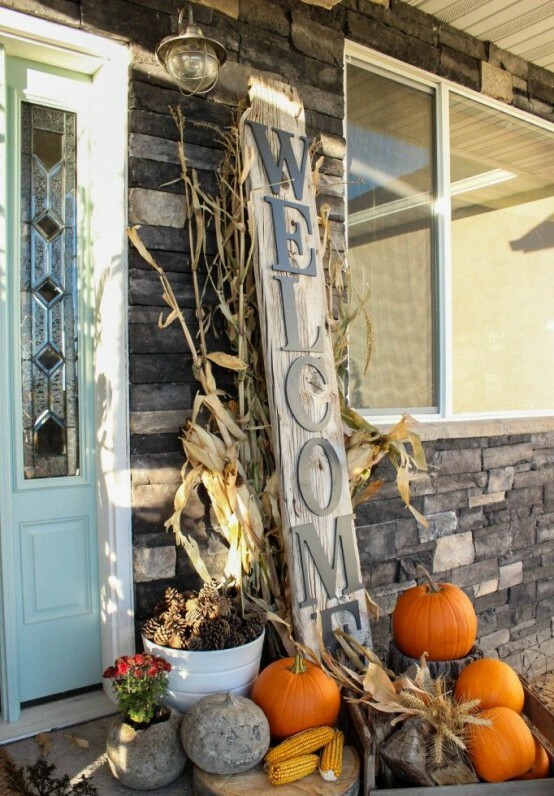 Distressed signs and chalk boards are very much the rage, and beside the front door is a perfect place for them. You can easily make a sign like this (also try the family name) by affixing metal letters (Google for sources like CraftCuts or or American Sign Letters). Look for ideas on Pinterest, or your favorite magazine, and cherry pick what you like, the hurricane lamps filled with acorns in this picture for example, and make it your own – perhaps foregoing the candle to just fill with mini-gourds, or tying a wide ruby red ribbon on the handle. 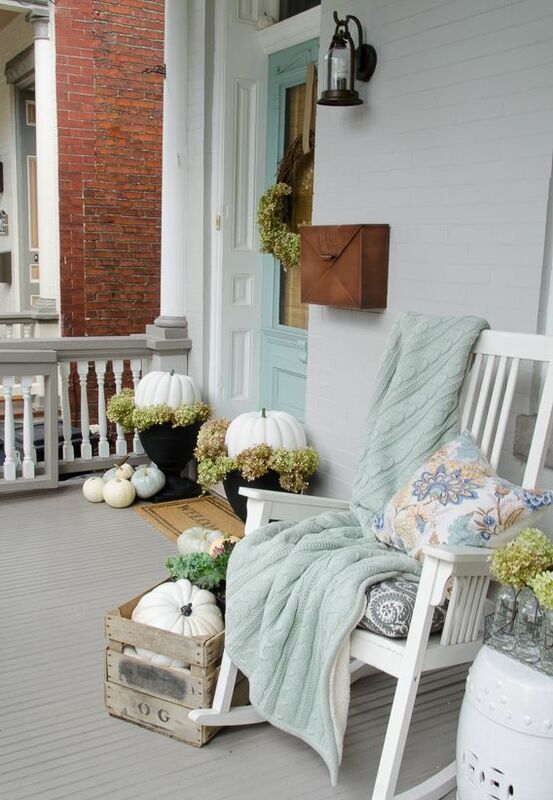 If you live in warm weather climates or by the beach, you can still create a seasonal feeling on your porch – look at the use of white pumpkins, dried hydrangeas and kale plants and a distressed wooden crate here. So inviting for visiting family to sit and read or talk or nap! 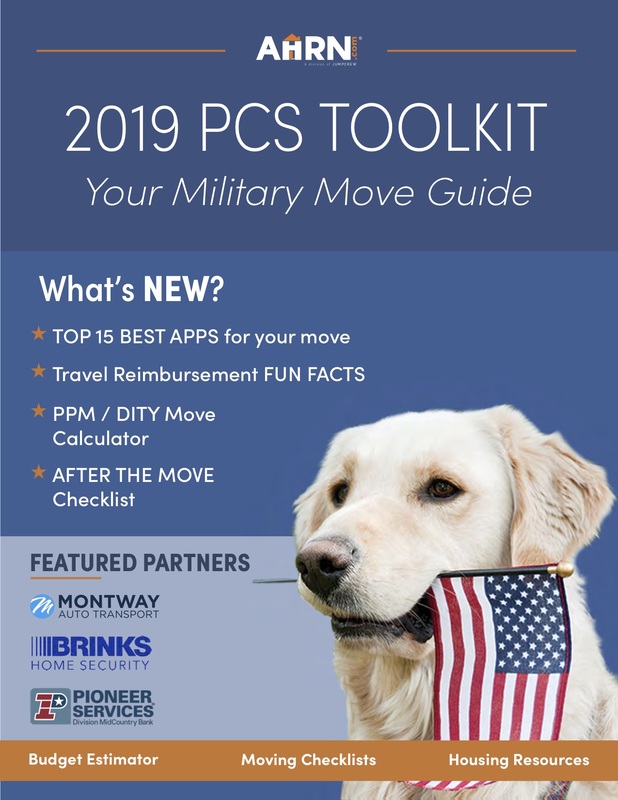 If you have kids, these months are especially full of fun things you can do with them, or keep them busy doing while you do your own thing nearby. I like the idea of focusing on what we’re grateful for. Here’s a perfect way to do that while including a bit of history: the Thanksgiving Mayflower made from a cereal box, including every person they are thankful for. 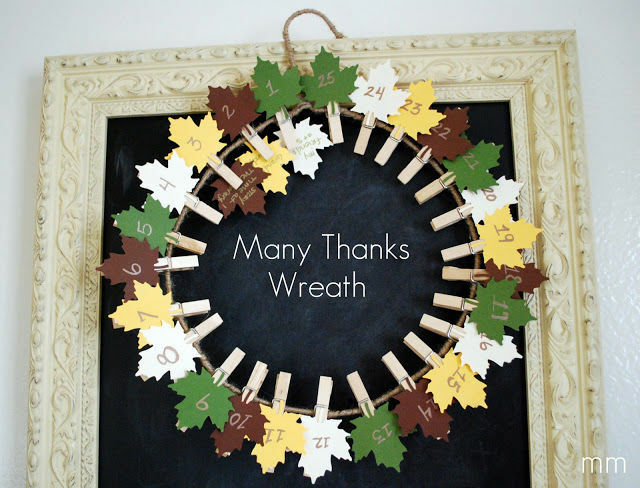 Or this indoor wreathe with a leaf for each day in November to which your family can clip what they’re thankful for each day. Find directions on Miranda Made.com. And something that everyone can participate in: Gratitude sticks. 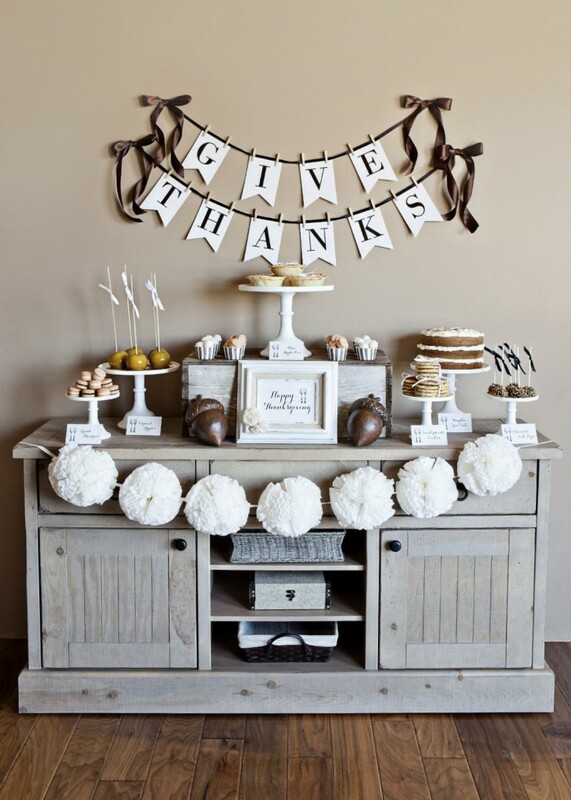 Take the tradition of having everyone go around the table to say why they are Thankful and make it a little different. 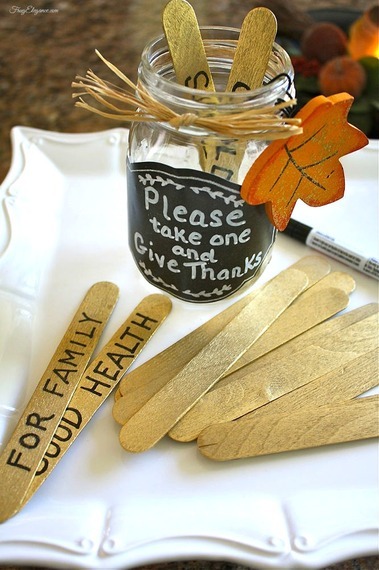 The idea is that over apps or cocktails guests write what they’re grateful for on the stick with sharpies and put them in the jar. Once at the table, they pick one as jar gets passed, then each can share based on what they pull. Gratitude multipled!! 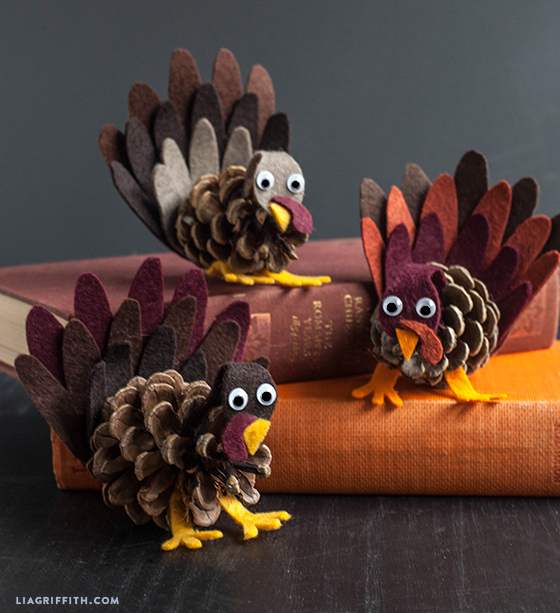 I love these goofy Pinecone Turkeys – there are many ways to make them. Here’s one way from Lia Griffith. For more fun projects, check out these 7 crafts for kids on The Thrifty Couple or on Pinterest. And while they do it, add to the fun and meaning of the holiday. Set up your tablet to show them videos about Thanksgiving (there are tons to choose from) on History.com!